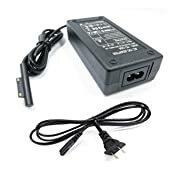 I forgot to bring an airplane-ready[**] laptop charger on a recent trip, so I purchased this from amazon.ca on the plane while travelling to Canada. This charger did NOT work with the Microsoft Surface 2-in-1 tablet PC I was using on the trip. When plugged in (a) the charger connector lights up, as if working, but (b) PC system icon reports "plugged in, not charging". This seems to be as reported by about half of the reviews. I initiated a return request with amazon.ca the same day. The vendor responded, but had not authorized the return before I had to leave Canada. On my return home, I found the the DHMXDC charger worked with an older Surface. I will therefore keep it - too much hassle to get the vendor to complete the return authorization - but I will be reluctant to work with this vendor again. Note **: by "airplane ready charger" I mean a charger that will work with the power outlets on many airlines. The surface dock that I was travelling with drew too much current, and caused the air line power outlet to shut off.